Chronic stress is often thought to be exacerbated by interactive technologies–but we challenge this assumption by designing and evaluating techniques for designing experiences and interactions that either mitigate known stressors or induce calm. The outputs of this effort are both novel interactive systems and heuristics and frameworks for designers and researchers to reduce stressors in their designs. In this talk, Dr. Neema Moraveji will discuss calming technologies and dive deep into the research that resulted in Spire, the activity tracker that interprets respiration rhythms to support balance, focus, and calm in daily life. 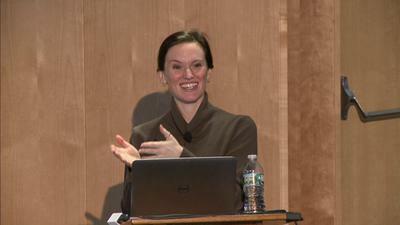 Previous talks in this series can be found online at http://www.media.mit.edu/special/groups/advancing-wellbeing. Neema Moraveji runs the Calming Technology Lab at Stanford University and is the co-founder of Spire. He teaches “d.compress: Designing Calm” at Stanford's d.school and his work has been covered in The New York Times, Wall Street Journal, NPR, and others. Prior to Stanford he led the Asia Center for Interaction Design at Microsoft Research Asia in Beijing. Dr. Moraveji received his BS in computer science from the University of Maryland at College Park's HCILab and his MS from Carnegie Mellon University's HCI Institute.